The Union League was founded in 1862 as a patriotic society to support the policies of President Abraham Lincoln. In its first two years, the League's Military Recruitment Committee raised 15 infantry, cavalry, and artillery regiments. Its Board of Publications printed over 2 million pamphlets for the Union cause. After the war, the League engaged in scores of civic projects, including civil rights and education improvements. The motto of the League is "Love of Country Leads". The League has given local support to the American military in every conflict since the Civil War. The early influence of the League gave rise to the creation of Union Leagues in other cities. The eight floor Union League building was completed in 1865, and is listed in the National Historic Register. The League has hosted U.S. Presidents, heads of state, and dignitaries from around the globe. Today, the League is a prestigious private city club with over 2700 members who represent a wide variety of backgrounds and professions. The League is also active in civic and artistic affairs. Its Commerce on Youth Work annually recognizes and rewards 250 young men and women with its Good Citizenship Medal. 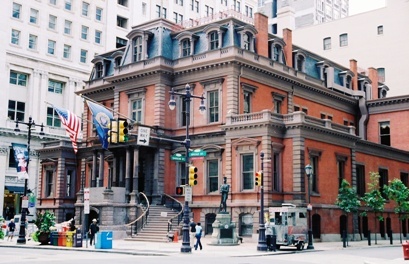 The Union League is located at 140 South Broad Street.